The best sign I have that a company I’ve invested in is dead, or near death, is the silence. This is why I encourage all of the founders I work with to send regular and detailed updates to all of their investors at least once per quarter, ideally once per month. Even if you don’t have investors yet, the process of taking a step back and asking yourself what’s going well, what’s not going well, and what you could do differently is hugely valuable. It doesn’t have to be complex. In the simplest case just start by sending out basic financial details: how many new customers you have, how much cash you earned in the last month and how much cash you spent in the last month and how much cash you have left in the bank. Then, later, as you grow, include some commentary about your current constraints – i.e. why aren’t you growing faster?, an update on your team – new hires?, open roles?, how you’re feeling about the culture?, and maybe point to some of your key numbers – how much are you spending to acquire each new customer? how much does it cost to support each customer each month? how many customers cancel (or “churn”) each month? For bonus points, ask other people in the team to contribute a short paragraph about their area – e.g. the product/engineering teams might want to list the things they’ve recently released and the things they are working on next; the customer support team might like to highlight their Net Promotor Score; the sales and marketing team might want to talk about recent promotions they’ve run and the effects of those. Make sure you talk about both the good stuff and the bad stuff. Investors are smart enough to realise that startups are not a smooth curve up and to the right, and will appreciate the honesty. More than likely they will want to try and help you solve the problems, when you’re up-front about them, rather than stressing about the fact that there are problems. The real payback on doing this will come when the time comes to raise more investment in the future. There is nothing worse for an investor than an email from out of the blue asking for more money. If you’ve taken the time to keep everybody informed of the progress then you’ll spend much less time telling them where you’ve been, so you can focus on where you want to go next, and you’ll likely find them much more enthusiastic about continuing to be part of it. So, even when you think you have nothing interesting to say, say something. Posted on September 23, 2014 September 24, 2014 Author Rowan SimpsonCategories Business, Startups9 Comments on Say Something! I’m Chair of the Board of Directors at Vend. In some ways, this is a role I stumbled into. I was one of the original investors, back when Vend was just Vaughan. We would spend a day a month and go deep on the business model and strategy. It evolved into a “proper” board after we raised more money and we added Miki to be an independent third voice in those meetings. It has since levelled up several more times, most recently after Barry was added as a fourth director. I have, on more than one occasion, been told that I don’t look like a chairperson. I’d like the record to reflect that the company has done okay despite this. What was just Vaughan is now 122 people, more-or-less, working in four offices in Auckland, Melbourne, Toronto, and San Francisco. And counting. We’ve grown from a handful of brave initial customers to over 10,000 retailers who use Vend to run their businesses – selling everything from jewellery to polo gear; gasoline to music lessons. We’ve raised over $35m, from what would have seemed to us at the beginning to be a dream list of investors from NZ, Australia, Germany and the US. We’re trying to spend that wisely to fuel further growth. I try not to be offended, because I doubt that was intended. But I am always tempted to ask what they think a chairperson looks like. Or what role they think would be more appropriate for me. The thing is, I’ve never really looked like the things I was. I didn’t look like a computer science student in 1994. I wore shoes, for a start. I didn’t look like a management consultant in 1997. I borrowed a suit jacket for the job interview. I never really got comfortable wearing a suit and tie. I didn’t look like a founder in 1999. I can only imagine what the property managers I was cold calling made of the sloppy kid trying to convince them to advertise on the “internet”. I didn’t look like a manager in 2003, when I came back from London to run the growing development team at Trade Me. I didn’t look like an angel investor in 2007, after we had sold the company and I was starting to think about what to do next. I suppose this should give me confidence to not put too much weight on what others think I do or don’t look like today. I figure the best thing is to show them what I am, by doing the job as well as I can, rather than waiting for their permission. Maybe doing that will cause them to change their mind about what makes a good director or chairperson. Or, maybe not. Whatever. Who are you waiting on to tell you that you qualify? PS I’m currently thinking about who could be the fifth person on the Vend board, and I’m determined to not limit ourselves just to people who look like directors. The ideal candidate would be somebody with a sales and marketing focus, ideally with experience in retail and/or small-medium business, who is excited to help us grow to the next level and beyond. Y’all are the closest thing I have to an old-boy network (and with the added benefit of not being all boys! ), so if you know anybody who we should consider for this role please do let us know. Posted on May 28, 2014 May 28, 2014 Author Rowan SimpsonCategories Business, StartupsTags Vend1 Comment on What are ya? If you make something remarkable then people will tell their friends. However, it’s sometimes overlooked that this is true for both remarkably good things and remarkably bad things. 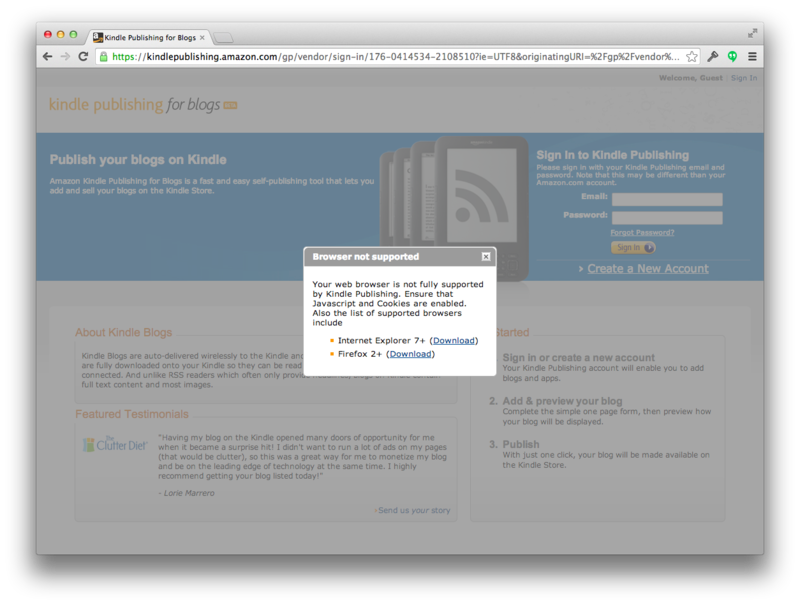 Some time ago I was experimenting with publishing this blog to other channels, and signed up for an Amazon Kindle Publishing For Blogs account. For some reason I still don’t understand I couldn’t just use my existing Amazon account, so I created a new account using the same email address. I never took it much further than that. Shortly after that, however, I started receiving emails from Amazon Vendor Central. Initially they were few and far between, announcing such irrelevant things as new fulfilment centres in West Columbia, SC and a new feature that allows you to download a bill of lading (BOL) for submitted routing requests. Annoying, but, infrequent enough to be ignored. If you have questions, please sign in to Vendor Central at https://vendorcentral.amazon.com or Advantage Central at https://advantage.amazon.com and click Contact Us at the bottom of any page. Please do not reply directly to this e-mail. It looks like the email and password combination you used is meant for a different site. You can use this email and password combination for Kindle Publishing for Blogs, or use a different email and password combination for Vendor Central. Bugger! Despite wasting more time trying to get around that road block, it was ultimately pointless, as it turns out there is no email preferences options on the account. Thou shalt be opted-in, it seems. I want to unsubscribe from the newsletter emails, but there is no link provided in the messages or any obvious option on this website. I immediately got an automated response from their ticket management system. The following are the five (!) responses I received in reply to this request over the following weeks, in full unedited glory. I have contacted the appropriate team regarding the same. I will be sure to update you on the progress of these investigations as soon as I have additional information. I am forwarding the following case details to our department concerned. Rest assured, they will look into it and get back to you at the earliest with an update. But, I was in luck, because he took it upon himself to escalate to his colleague, Manoj. Please note, I am working with the concerned team regarding this and will send you additional correspondence as soon as we have an update. This may take 3 days approximately. The three day estimate, it turned out, was a little optimistic. Please note, I am still waiting for an update from the concerned team. I will send you additional correspondence as soon as we have an update from them. Sadly the next message from Manoj was not so hopeful. As per the update from the concerned team, there is no way to “unsubscribe” vendors from vendor newsletters. Newsletters go out to all vendor central users as defined when the newsletter is setup. Therefore, you may report news letters to ‘Spam’ folder. Please click one of the following links to let us know how we’re doing. Your input helps us improve the vendor experience. Did we successfully answer your question? DJ: How tremendous is Fatboy Slim? Brad: The band of the 90’s, if you want to call it a band because it’s a one man name. It’s easy to get seduced by the idea that in order to be successful you have to be big. Maybe that was true in the past, but it’s not necessarily true now. And it makes it much harder to tell from the outside who is winning. When we re-created the photo from 2011 with the much larger team in 2012, in the same location and same t-shirts, the comments on Twitter were interesting. Many of those sending their congratulations seemed to assume that big team = big success. Actually, the formula for companies in this situation in the short-term is more like big team = big payroll. The success comes later. Sometimes. 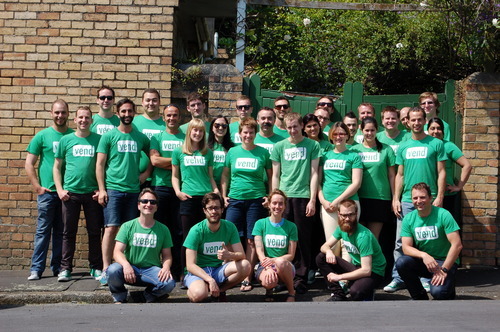 Luckily at Vend our underlying business has grown at an even faster rate than our headcount. Or, maybe it’s not luck? 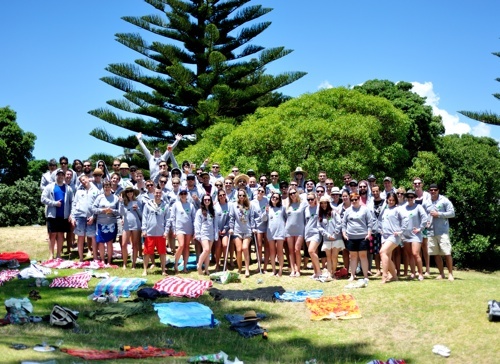 It’s great to see that as the group gets bigger so does the potential to do something really impressive. Here is the 2013 team photo, taken last week, complete with colleagues who have joined us from the new offices in Melbourne, Toronto and San Francisco. I can’t wait to see the 2014 version! Earlier this year Hawkes Bay based Majic Jungle Software launched an awesome iPhone/iPad game called The Blockheads. We were honoured to be part of the group helping to beta test it prior to launch, and it was great to see it develop over that time into a delightful and engaging game. It was no huge surprise to see it go on to top the iTunes downloads charts and create the third big success from this developer (1). As it turns out the “team” in this case is just Dave Frampton (2). He’s the band of the 90’s, despite the one man name. I was fortunate to see Paul give that presentation in person a couple of times, and one of the numbers that really sticks with me is that there are only about 1.3m FTE jobs in NZ. The challenge we collectively have is to make as much from each of them as we can. Everybody from big companies through to individuals working by themselves both have a role to play. It’s easy to complicate business, but actually the rules are very simple: in the long run you win by making stuff which is so great that people will pay you more for it than it costs you. There are lots of different ways that you can organise yourself to achieve that outcome.